The Customer Activity screen is available once the customer is selected from the available customers in >> or from the button on the main Frazer screen. Click on the part of the screenshot you have questions about! The Stock Number of the vehicle can be changed by going to >> . After a vehicle has been sold, there is no option to simply switch vehicles on the account unless the sale is canceled by going to >> and selecting the button on the LEFT. Top of Page. The mailing address of the customer is displayed and can be changed by going to >> . Top of Page. The sale date can only be changed by cancelling the sale, moving the sale back to the prospect file, and then changing the sale date before you re-complete the sale. Cancel a sale by going to >> and selecting the button on the LEFT. Top of Page. 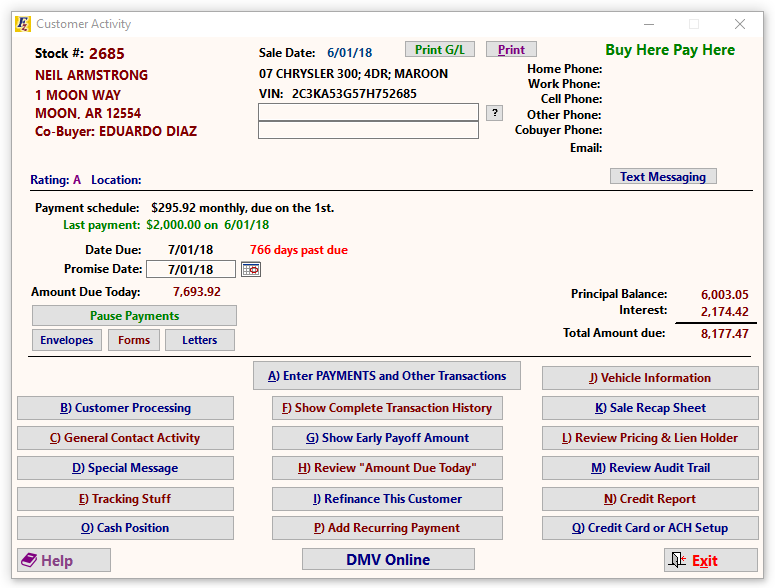 The Vehicle Description is a short description of the customer's vehicle. To change this information, click . The account's selected Vehicle cannot be changed once the sale is made, unless the sale is canceled by going to >> and selecting the button on the LEFT. Top of Page. This button prints the information seen on the Customer Activity screen, including a breakdown of how the "Amount Due Today" was calculated. Top of Page. The Contact Information area contains immediate contact information for your customer. You may change this information by going to >> . Top of Page. A Promise Date is used to track when a customer will be in to make a payment. By focusing on the promise date instead of the due date, the dealer avoids reminding customers to make their payment on time when the dealer knows the customer will be a bit late. (For example: the customer can't make it in on Friday, but will be in on Monday.) Top of Page. Clicking the Print Envelope button prints an envelope to the address shown in the top left corner of the screen. If an envelope has not previously been printed from Frazer, the Envelope Setup window allows the envelope to be programmed to print properly. If the envelope setup needs to be updated, go to >> >> 6 - Printing Options and click on . Top of Page. The Vehicle Information button brings up a detailed vehicle screen about the customer's vehicle. Information about that screen is available here. Top of Page. TheSale Recap Sheet button prints a recap of the sale with profit information as it was calculated at the time of the sale. Top of Page. The Credit Report button pulls up credit report(s) previously pulled for the customer, or allows a new credit report to be pulled. Top of Page.